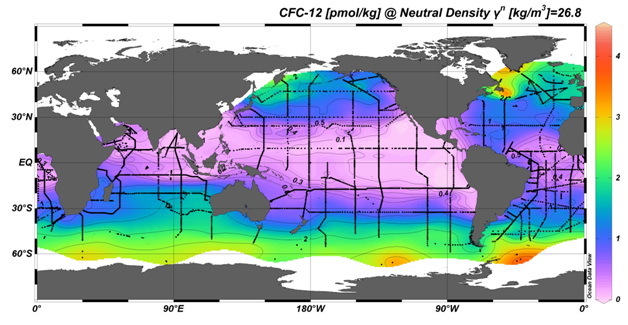 The figure (above) shows the concentration of dissolved CFC-12 in the ocean at the neutral density level 26.8. Black dots indicate the location of stations where dissolved CFCs were measured as part of the World Ocean Circulation Experiment (WOCE). Dissolved CFCs highlight regions of the ocean where gases in the atmosphere can be carried on decadal time scales. The PMEL Ocean Tracer Program has been using dissolved CFCs as time-dependent or 'transient' tracers of ocean circulation and mixing processes. The concentrations of CFCs, along with a number of other anthropogenic compounds (e.g.CO2), have increased significantly in the global atmosphere during the past century. CFC concentrations in the surface ocean can be modeled as functions of location and time. Studies of the entry of CFCs from the atmosphere into the surface ocean, and the subsequent transport of these compounds into the ocean interior provides a unique description of the time-integrated circulation of the ocean on decadal time scales.